What does basketball, tennis, rock climbing, jogging, and mountaineering have in common? No, it’s not that they are all sporting activities. These sporting activities and countless others require you to wear specially designed footwear. Mountaineering and hiking involve traversing over rough and unforgiving terrain. It involves scrambling over sharp rocks, walking on sticky mud, stepping on moss, and crossing streams. It involves standing precariously on a steep slope; digging for a foothold during a punishing ascent, and walking for long hours, days, or weeks. Such conditions demand a special breed of footwear. Imagine if you’re wearing shoes that are not geared towards withstanding such abuse. If the sole rips apart from the rest of the shoe, then you’re in big trouble. It would be extremely difficult, nay, impossible or even dangerous, to continue walking. There wouldn’t be any treads to grip the soil or outsole to protect your feet from razor-sharp rocks. Imagine if you’re wearing shoes that are too tight, it would be a nightmare to walk, and by the time you reach your destination, your foot will be on fire with blisters and dead toenails. Your trekking shoes are truly your most important piece of adventuring equipment when you’re out there in the wild. Thus, it is vital that you wear the right pair. It doesn’t matter what brand, model, design, or set of features that a pair of trekking shoes has. The most important thing to consider when you choose your adventure footwear is how the pair fits your feet. An excellent fit properly tackles three dimensions of your feet. * Width: Your feet should not slip inside the footwear. 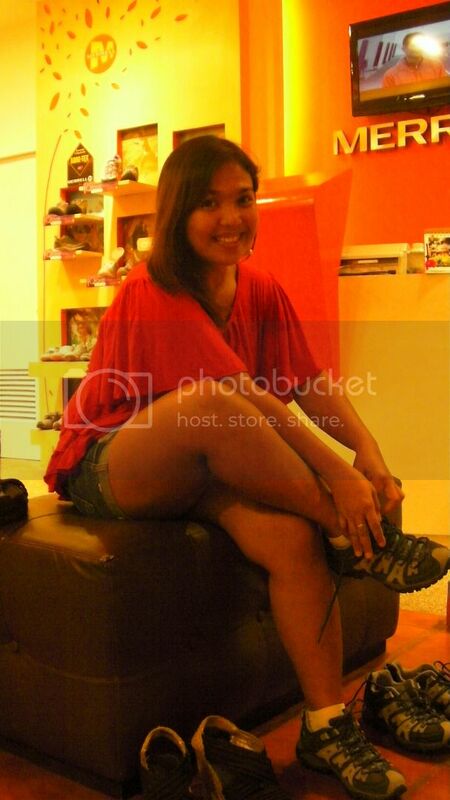 On the other hand, it shouldn’t feel as if the shoes are squeezing them. * Volume: The entirety of your foot must securely fit within the shoe. A properly fitted shoe should feel as if there’s a hand holding your foot over the instep, specifically the area where the laces are. As you walk, your feet should feel “silent” within the boot. Now that you know the essentials of a good fit, it’s time to actually go shopping for your trekking shoes. 1. Shop for trekking shoes late in the day. By that time, your feet would have expanded to its maximum size. Late afternoon and early evening are the best times to choose shoes. Also, before heading down to the store, clip your toenails short. 2. Bring socks that you normally wear during your trek. Wearing familiar and comfortable socks allow you to quickly and properly assess the correct fit and feel of your footwear. Don’t go sockless; not only will it hamper the fit but it’s also disgusting to fit sweaty, smelly, dirty feet in pristine shoes that you may not buy. 3. Do not simply rely on your feet or shoe size. Keep in mind that shoe sizes differ from one brand, design, or style to another. For instance, my feet feel comfortable in size 10.5 Merrell but feel constricted when I try North Face trekking shoes of the same size. Simply refer to your feet or shoe size to try out the first pair of your choice, then work your way from there. * Do your feet feel squished? If yes, then the width of the shoe is most probably too narrow. * Do your heels slip as you take a step? If yes, the shoe is probably too large. Or you may want to check the laces and straps. * Do you feel any pain or discomfort on any part of your feet? If yes, the shoes may be the wrong design for your feet. 5. Walk through each pair around. Since you will be using the shoe on uneven terrain, you should try the pair on various “terrain” of the store. Walk up and down staircases. Jump. Leap. Run. Do they feel comfortable? 6. Stand on a steeply inclined surface with your toes pointing down. Your feet should stay in place inside the shoes. Additionally, your toes should not hit the end of the toe box when you’re standing or walking down an inclined surface. You want just enough room so you can wiggle your toes. 7. Stand on a steeply inclined surface with your toes pointing up. If your feet slide backward, then the shoes you selected have an excessively high volume. Look for shoes with lower volume or tighten the straps or laces. 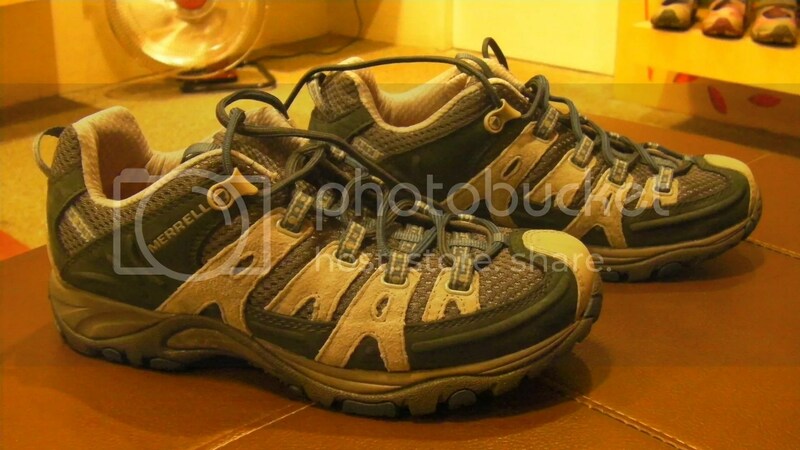 Another important to look for in ideal trekking footwear is your chosen pair’s outsoles. The outsoles act as your first defense, weapons, and tools against the terrain, so you would like them to really work for you. On all trekking shoes, rubber is the raw material used. Look for one stamped Vibram, the foremost and the most reliable brand of lug soles. So what should you be looking for in a sole? 1. How stiff the sole is a matter of personal preference. Personally, I prefer a stiff, hard outsole because it provides better stability and comfort during long hikes on uneven, rocky terrain. However, Sweetie prefers a softer sole so she can comfortably wrap her feet around on tree roots, rock outcroppings, and crevices. 2. The sole should have an aggressive lug pattern, which provide excellent traction. Go for deep, thick lugs to enhance your feet’s grip on the trail. Look for soles with widely spaced lugs; these offer excellent traction and shed mud quickly and easily. 3. 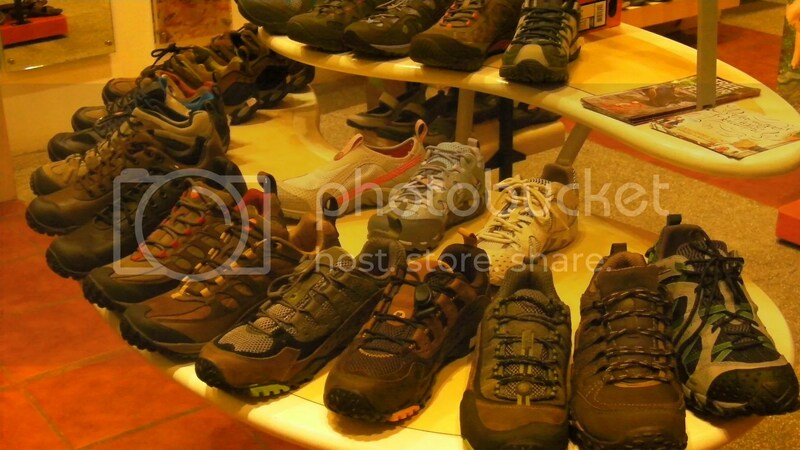 Choose a trekking shoe with a heel brake. A heel brake is a sharply defined part of the shoe located on the heel. It allows your feet to dig into the dirt, which reduces the risk of slipping during steep descents. Additionally, a heel brake allows room to tie in a gaiter strap.